Children bickering and fighting can derail even the most mindful parent. Here's my advice to Marilyn (children 5, 4) for how to get back on track. I find setting natural consequences hard at times. So my son and daughter each got these paper police cars that you create by folding. I made them each their own. Well, my son thought it was funny to crush my daughters police car. As a consequence for his actions I told him he needed to give her his, and he would get the crushed one. Naturally he was upset and I tried to connect with him by saying, "I see how upset you are. You feel I'm not being fair. You don't want a crushed car." He nodded in agreement with me, and I asked him if he thought what he did was fair. He said, "No." He's still upset, and I'm keeping them apart for a few as I read somewhere that when they can't play nice to separate them temporarily. Just wondering how I could have handled this differently. they are simply what occurs. If you find yourself "setting" natural consequences, what you are probably actually doing is creating negative consequences that are punitive, which at best may control the child's behavior briefly, but leave him feeling bad, guilty and/or resentful - not the lessons you intended. Mindful parenting feels rewarding to you and to the child, which means that as a mindful parent, you will never be satisfied with creating negative consequences or with the results. So pat yourself on the back - your inner compass is on track! CONNECT FIRST, THEN PROVIDE GUIDANCE. SWYS (matter-of-factly): "You crushed her car and laughed. That was a fun game for you, and look at her face. It wasn't fun for her. She's angry and crying. She didn't like that! Hmm. Doesn't look like that's what you wanted, since your smile's gone now, too. " Pointing out each child's feelings like this without blame or judgment allows your daughter to feel heard and your son to feel more compassionate. CAN DO: "You want to play car-crushing and she wants a not-crushed car. Hmm. Must be something you can do." 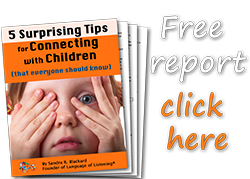 Stating what both children WANT clarifies the problem that needs to be solved. Then you turn the problem-solving over to the kids, return to SWYS, and watch for things you like so you can use the third step - finding STRENGTHs. Son (to his sister): "You can still play with the crushed car." Daughter: "I don't want a crushed car!" Son: "Well, you can crush mine if you want." Daughter (giggling): "Ok! There! Bam!" SWYS: "You let her decide if she wanted to play. Now you're both laughing That's what you wanted! Asking worked." STRENGTH: "And that felt fair to you both! You both like playing fair." This is what "teaching" by natural consequences actually looks like. I put teaching in quotes because character strengths never need to be "taught," just found and pointed out since they all are already there in each child. Thank you Sandy, for your response and especially the example. In the heat of the moment it can be frustrating and hard to think, but I know there's a better way to handling these types of situations. With the constant battle that goes on, there are lots of chances to practice! You're right, it is hard to think! That's why this works so well. NO THINKING. Just description — in through the eyes and out through the mouth. SAYing WHAT YOU SEE without judging, questioning, teaching or fixing helps you discover your child's intentions. That's where you'll find the gold. And practice works best in the easy moments. Describe what your kids are doing, saying, feeling and thinking often when they are playing well together or alone, and soon it will become your natural first response. Even SWYS takes a little bit of thinking and sometimes I fall into the reacting instead of thinking. I know SWYS works better…..thanks for all your words of wisdom! Remembering to SAY WHAT YOU SEE is really the only little bit of thinking it takes to respond. Not-thinking can be the trickiest part. Seriously, I really am asking you to just start describing what you see objectively. Even when spoken through gritted teeth, SAY WHAT YOU SEE works wonders for you and the child. It validates the child and helps keep you from reacting because hearing your own objective description gets you present. We react to what we think, not what we see, so staying out of your head as much as possible makes a big difference and allows you to follow your child’s lead and most quickly step into their perspective. It’s such a relief when you discover that what to say actually comes from them. It’s like reading a book. The story is out there, not in your head. What helps most is practicing SAY WHAT YOU SEE in the calm moments until matter-of-fact description becomes your natural first response. Your work is clarifying for yourself what you like and don’t like, which is the work of personal growth.